The Knittington Fairy Shop is closed at the moment. I would like to re-open it some time soon. 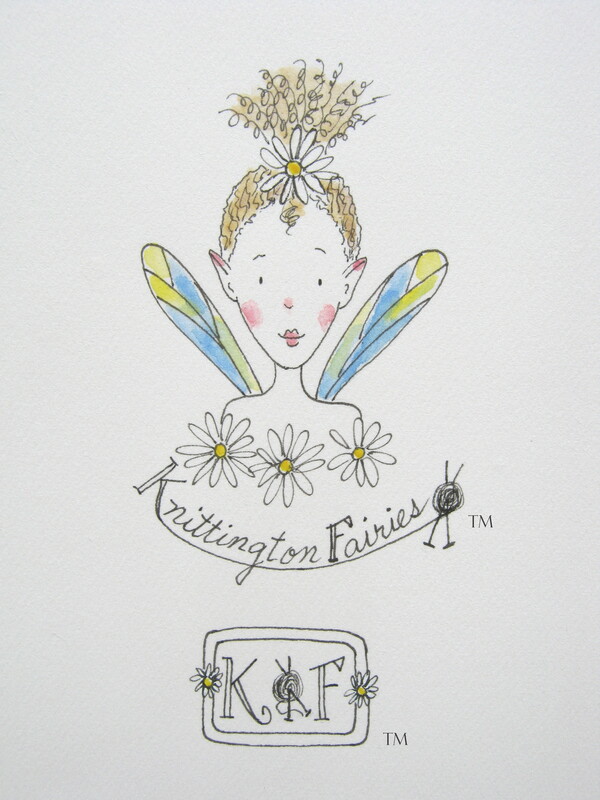 If you are interested in The Knittington Fairies, and would like to see them back on the market, please drop me a note. You can contact me by clicking Licensing/Contact. Thank you for visiting. Welcome to Knittington! 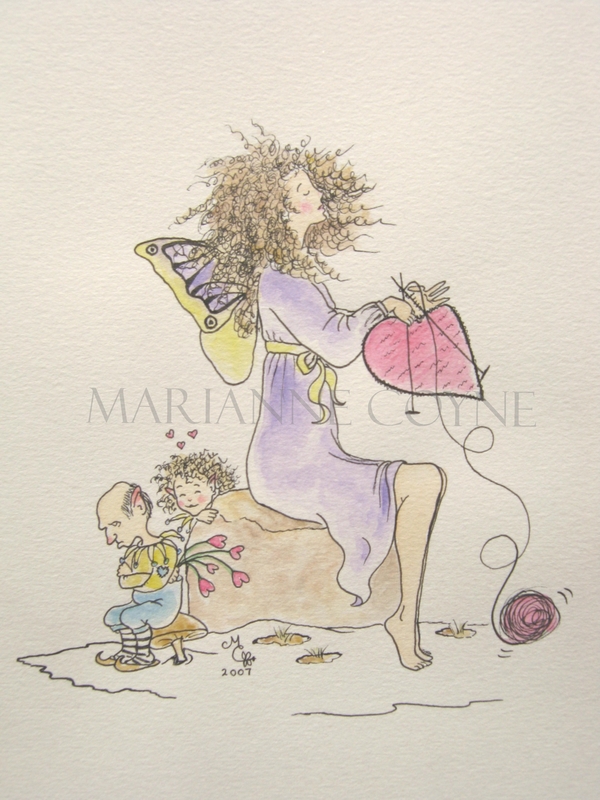 Here you will find my beloved fairies knitting their way into your hearts. We hope you enjoy your visit. If you are interested in licensing any of the designs shown here, you may contact me by clicking Licensing/Contact. 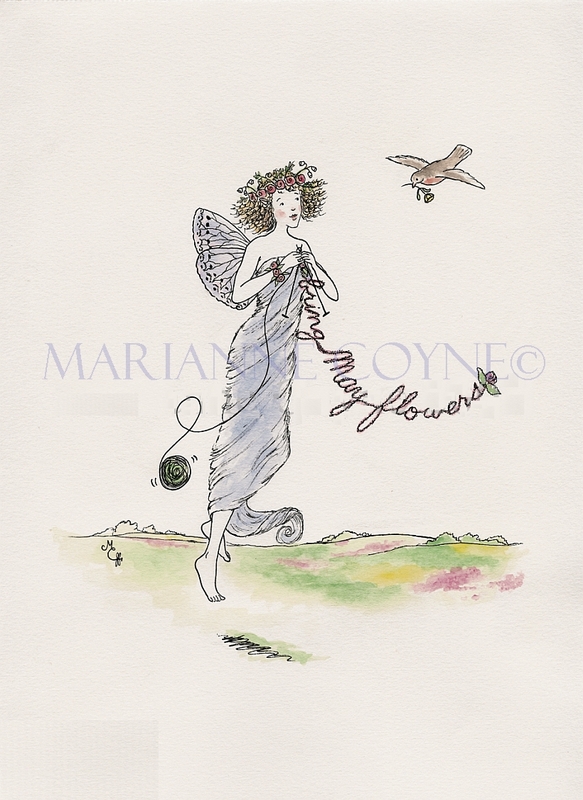 My fairies are now offered as note cards from the original watercolors. Each note card comes with its own envelope and are blank inside for your unique message. The images are printed on white card stock. A smidgen of fairy glitter is added for sparkle, unless otherwise noted. 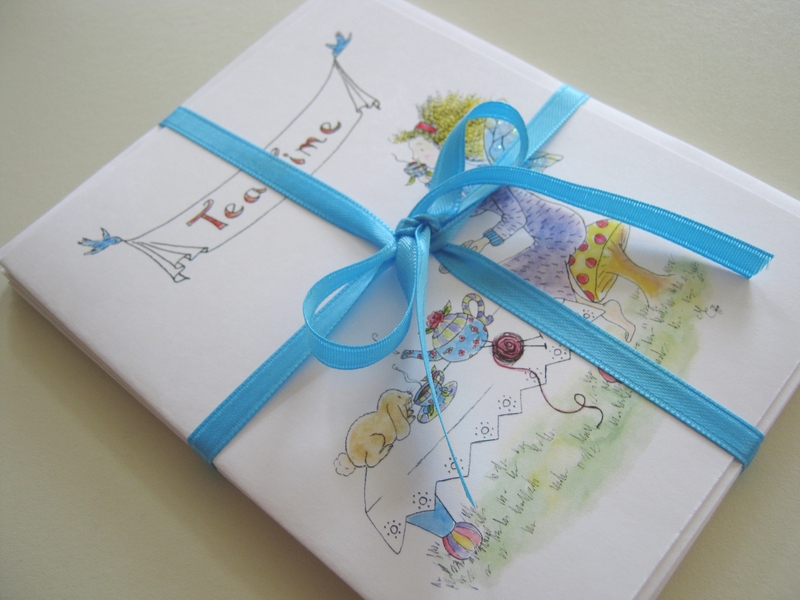 Orders of 5 or more cards will have a pretty ribbon tied around them at no extra charge. Watermark is for copyright only and will not appear on note cards. Color intensity may vary on different computer screens. These are low resolution images. Images will be much crisper on product. Our little Daisy always stands out in the crowd. She believes in discovering and developing that special part of you that is uniquely you. Giving it expression makes the world a brighter place. All the Knittington Fairies agree Daisy’s sunny disposition makes her the perfect fairy for welcoming visitors to Knittington. Amelia is Knittington’s social ‘butterfly’. Tea parties are her specialty. 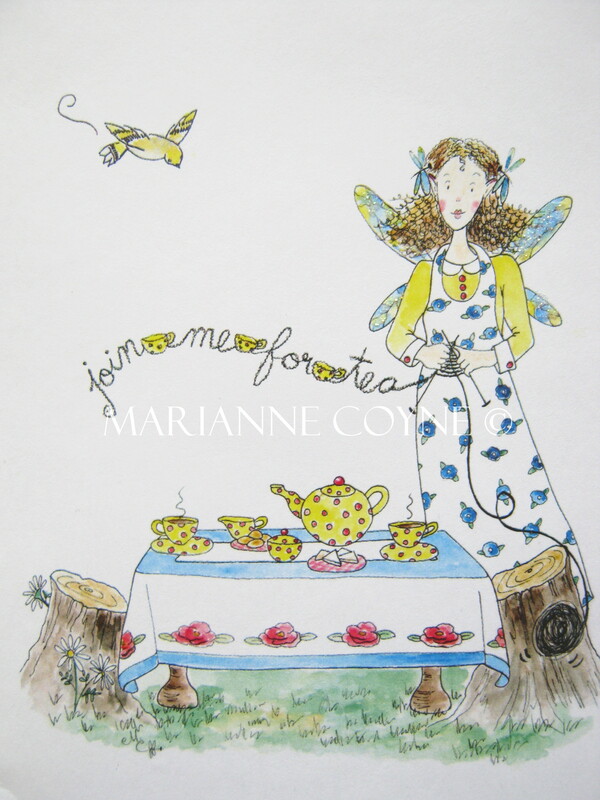 She delights in serving exotic teas from her extensive collection of whimsical tea sets. Her delicious finger sandwiches and sweet confections are not soon forgotten. An invitation from Amelia in a Knittington mailbox is an anticipated treat. 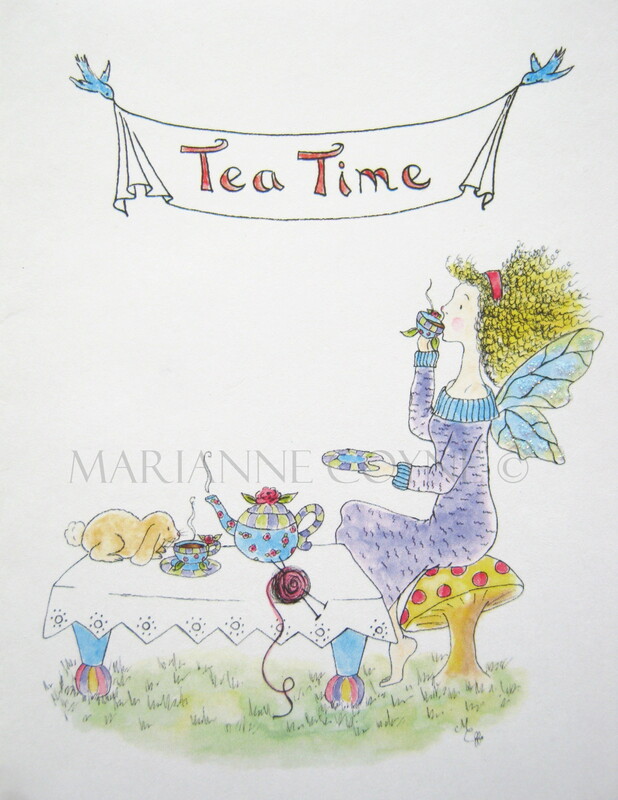 These note cards make great tea party invitations. Laurella is proof that dreams can come true. She gives life to everything she touches, and she wouldn’t have it any other way. A pure heart, and a little faith with actions to match are her secret ingredients. Wonderful for graduations, inspiration, or just a friendly hello. Sensible Brianna has a serene nature. She often quotes her favorite motto, “Sometimes you just have to stop and smell the tea”. It’s a reminder to us here in Knittington to treat ourselves with quiet time, and feed our souls. Christmas magic is in the air. 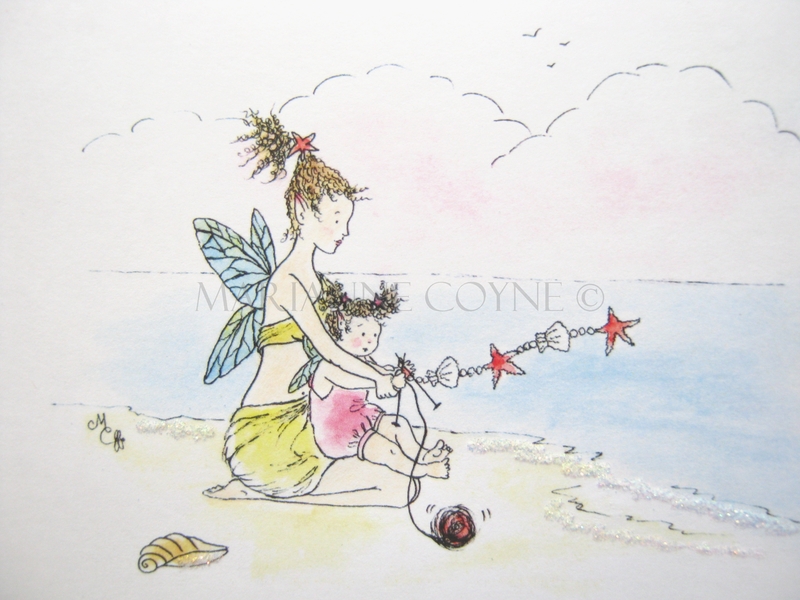 There’s much to be done, and the fairies are all excited. 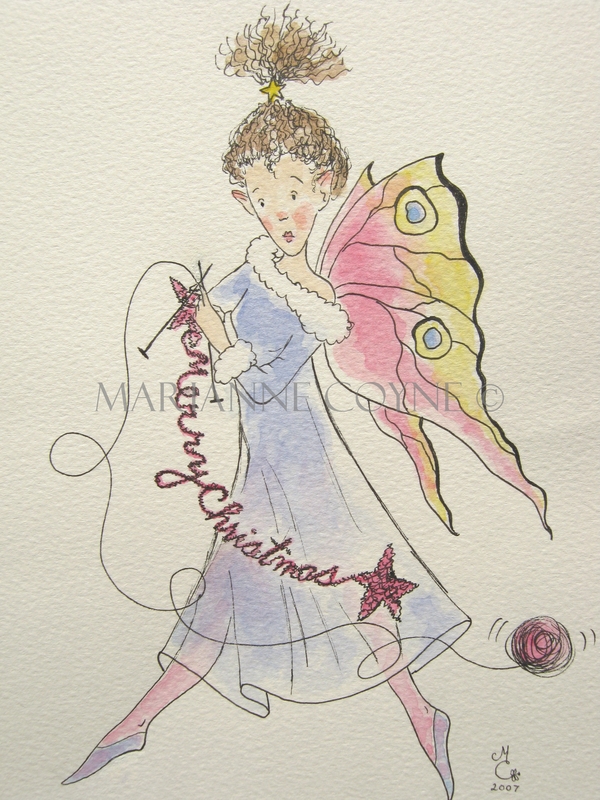 Elenora frantically finishes a Merry Christmas wish to you from all the fairies here in Knittington. 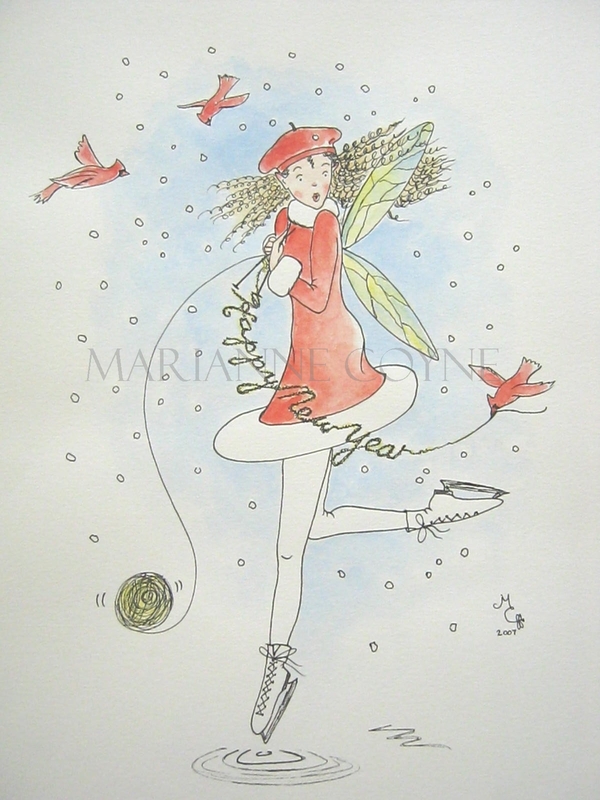 Darling Penelope is trying her best to bring you the happiest new year wishes. But her mischievous friends seem to have her quite unraveled. Not to worry, lovely Penelope always manages to keep herself together, and in the end, gets her message across. We’re not quite sure what put our Eloise in such a tiff, but she’s determined not to give her heart away to just anyone. 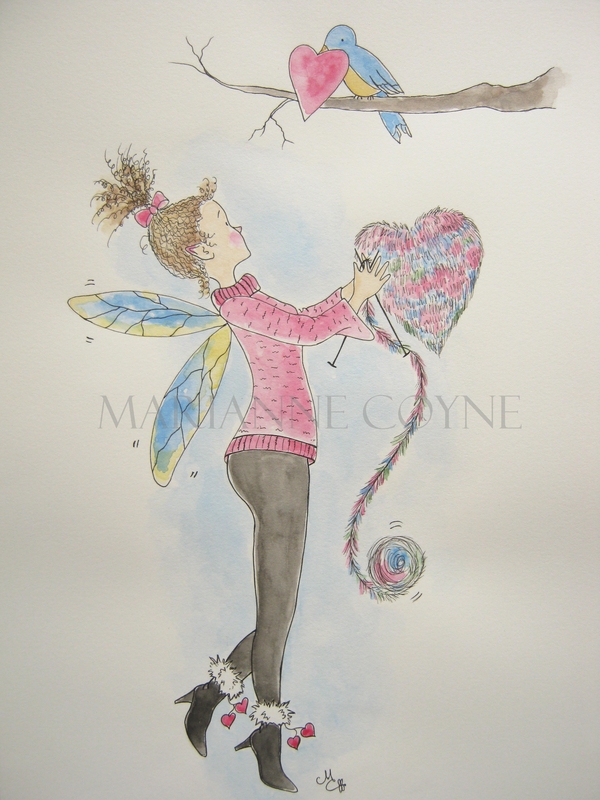 But our little gnome friend must not dismay ~ love is closer than he thinks. There’s more to Francesca than her perky ponytail and cute ens amble. She’s ever quick to reciprocate a kindness, which only adds to her charm and “hip” demeanor. Knitting fun scarves and creating unique you-can’t-find-this-just-anywhere gifts for her friends is her favorite pass-time. 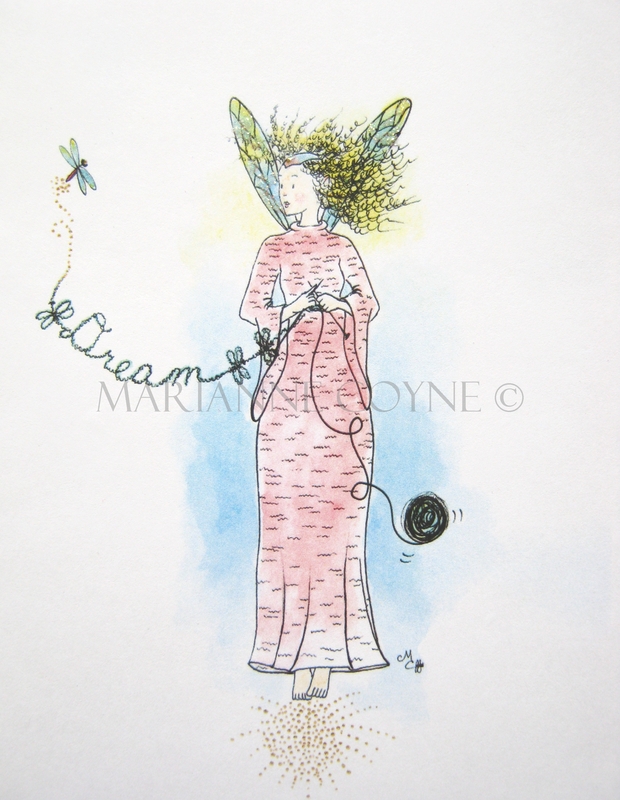 She’s an encouragement to all of the Knittington fairies to let their imaginations soar and create, create, create! 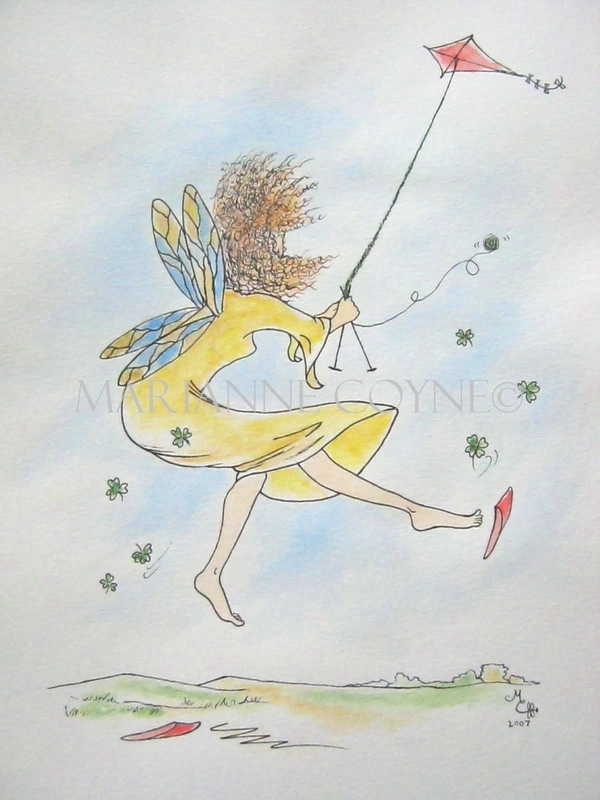 Whenever March appears it always comes in with swirling gusts. Willowy Genevieve is swept quite off her feet. But no matter ~ she manages to keep hold of her kite, which is the highest it’s ever been. That~a~girl, Genevieve! Rain, rain go away? 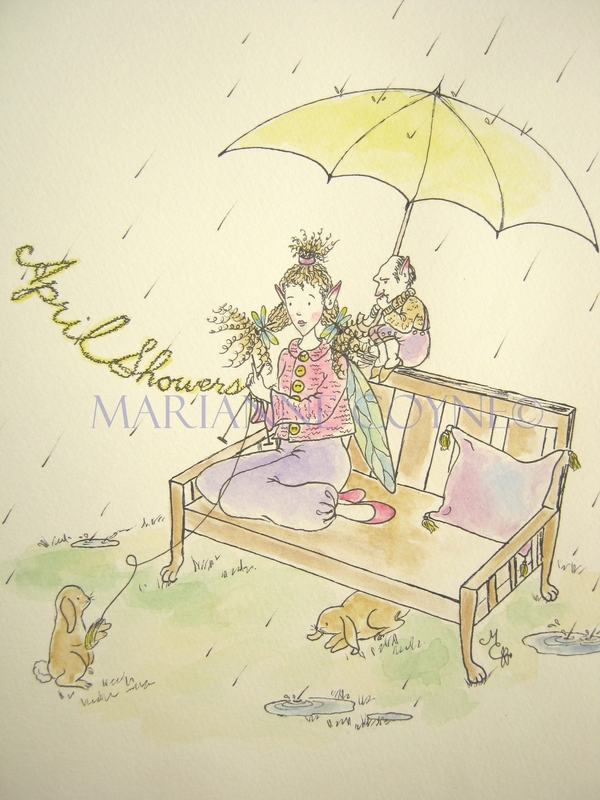 Grace never wishes for the April showers to come back another day. After all, how else would the May flowers grow? She knows patience is important, but her little gnome friend seems to be running low on that secret ingredient. 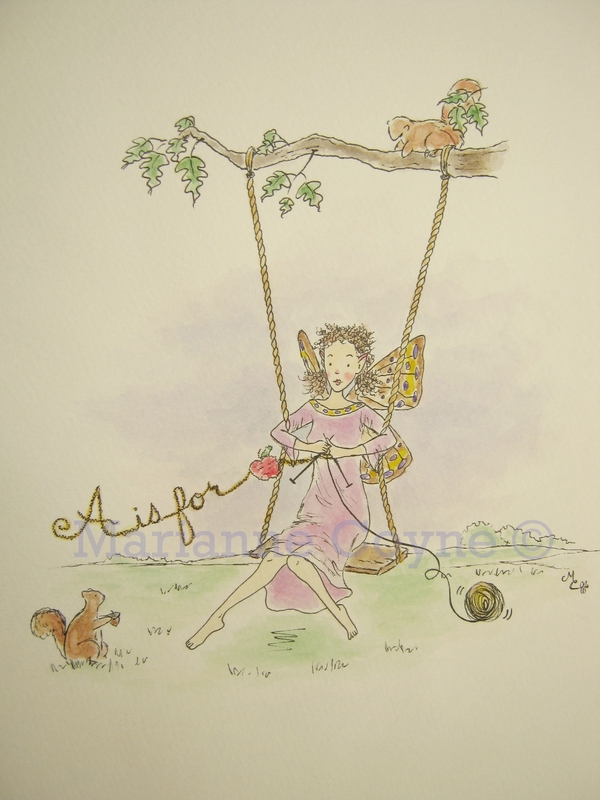 If you ask me, I think he is anxious to court his newly found sweetheart (see Eloise, one of February’s fairies). Ah May! The sweetest breath of Spring, when the garden resolves to give up its secrets, and the meadow releases its hidden treasures. Bloomalia’s greatest joy is to announce the arrival of May to all of Knittington, where the primroses are rosier, the daisies are sunnier, and the lilies are most fragrant. Bloomalia and her dear friend, Robin, delight in helping bring in this happy month to the season. 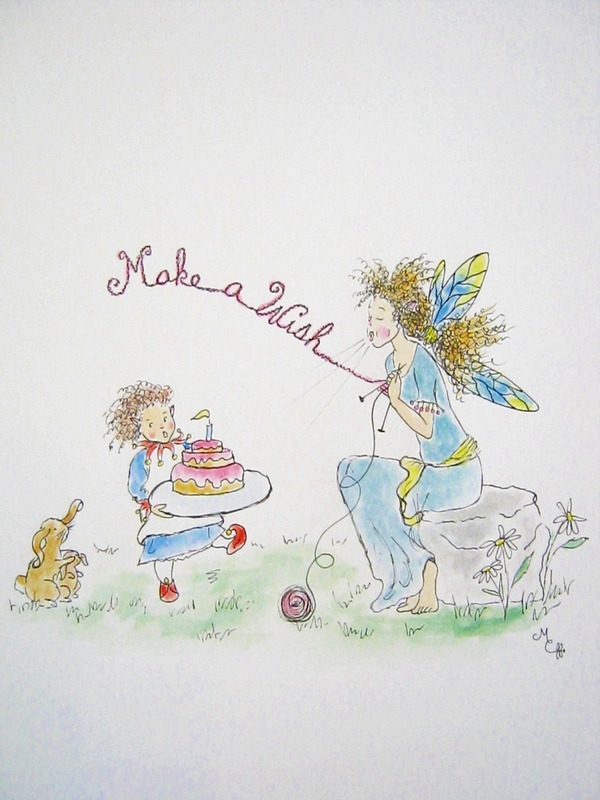 Emma Jane is an exuberant fairy, who believes in putting everything she has into a wish. Though she is sometimes unaware of her strength, her little friends can quite attest to the magnanimity of her success. Our June bride, Lovliana, is ready to say “I do” to her beau. She certainly is lovely, isn’t she? Blue skies and rose petals ~ what a perfect combination! Set of 5 variety pack (To see all 5 designs click here). Note cards are blank inside and are 4 1/4″ x 5 1/2″. The set comes tied with a blue ribbon. Price ~ $6.75 (plus ship & handling). 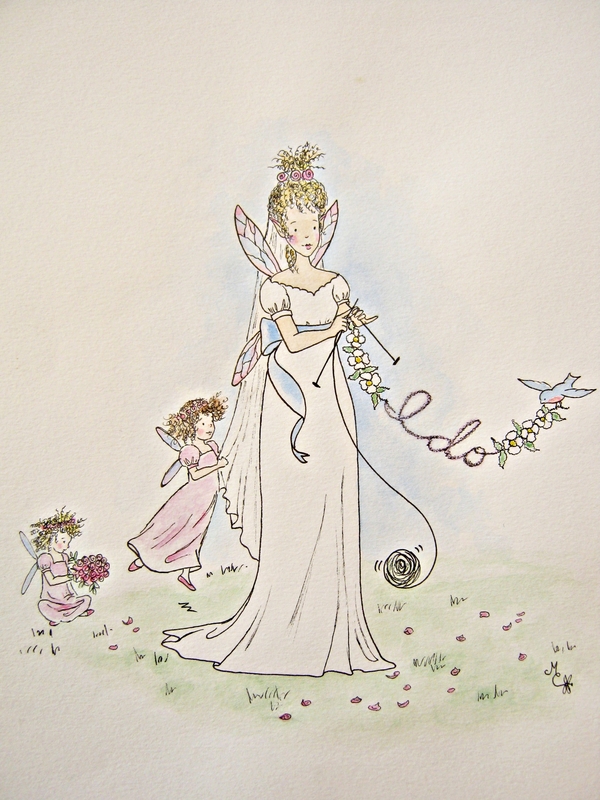 All the fairies in Knittington take pleasure in dressing for special occasions, and Julia is no exception. The month of July bursts with the excitement of picnics and fireworks, warm sun and sweet breezes. 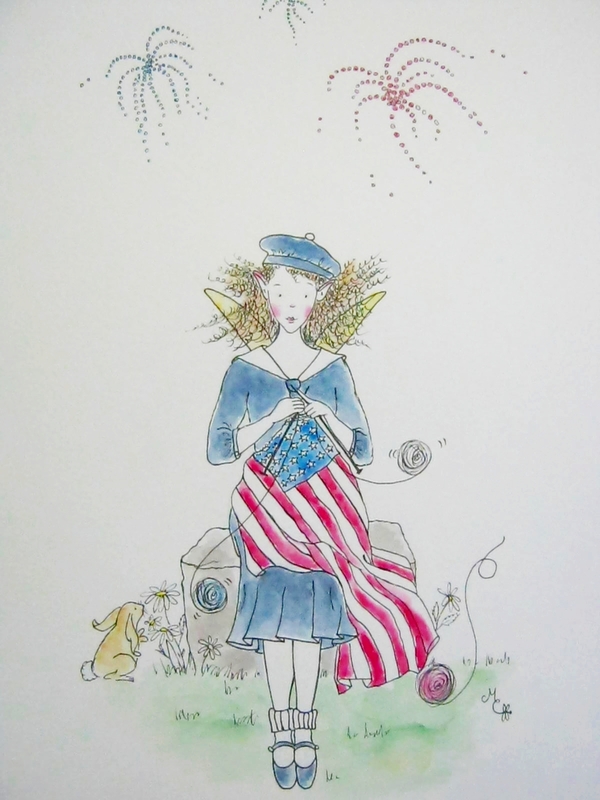 Julia inspires all the fairies to patriotism by knitting flags for everyone in her sailor inspired dress. Honorella devotes herself to learning. She knows that life is full of wonderful lessons. Her philosophy that “wisdom shared is wisdom gained” makes her one of Knittington’s most beloved teachers. September is her favorite month, full of the excitement that comes with preparing for a new school year, when every pupil is worth the effort. Even the little squirrels in Knittington benefit from Honorella’s simple yet valuable instruction. 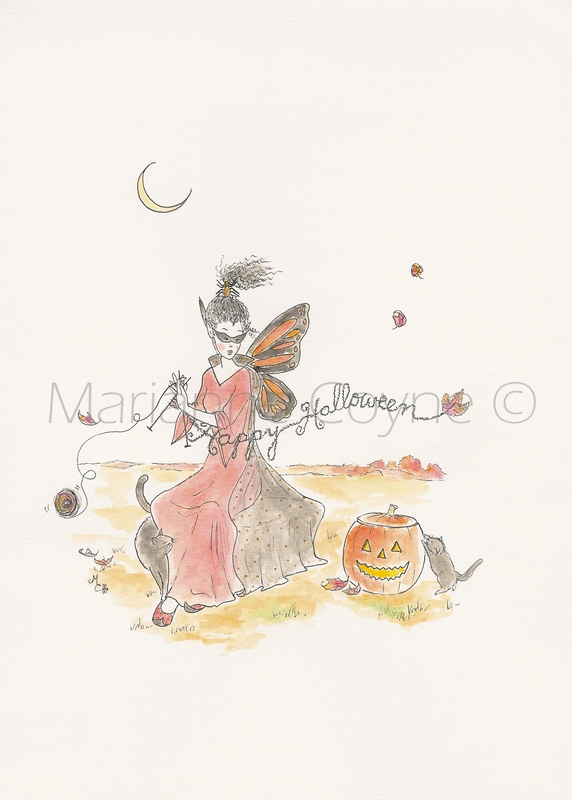 Cool breezes, leaves changing color and all awhirl ~ yea, October! This charming time of year gives Matilda a chance to cast [on] a spell of good cheer that’s sure to raise your spirits. But have no fear, because All Hallows Eve in Knittington is never scary. Happy Jack-O-Laterns, cuddly black kittens, and fun costumes bring fairy-bright smiles…and don’t forget the sweet treats! I appreciate all your sweet and encouraging comments. However, for the sake of space, please click the “Like” button if you like what you see. Or you may leave a comment on my home page, or contact me personally.. Thank you…I appreciate your visits and patronage here at Leisure Lane. I look forward to seeing you again. I am an avid knitter and tea drinker. I am so happy to find your website. I’m loving my Xmas cards. I hate to even give them away 😉 ! So…I think what I need to do is save one and get it framed with matting for an annual Xmas wall decoration. If you figure out a way to make Xmas decorations with your designs, these will be like collectibles for those precious small table top trees. I love themed Xmas trees. I have one for wine related, one for mermaids, and would love one for knitting and faeries. Up, up and away! 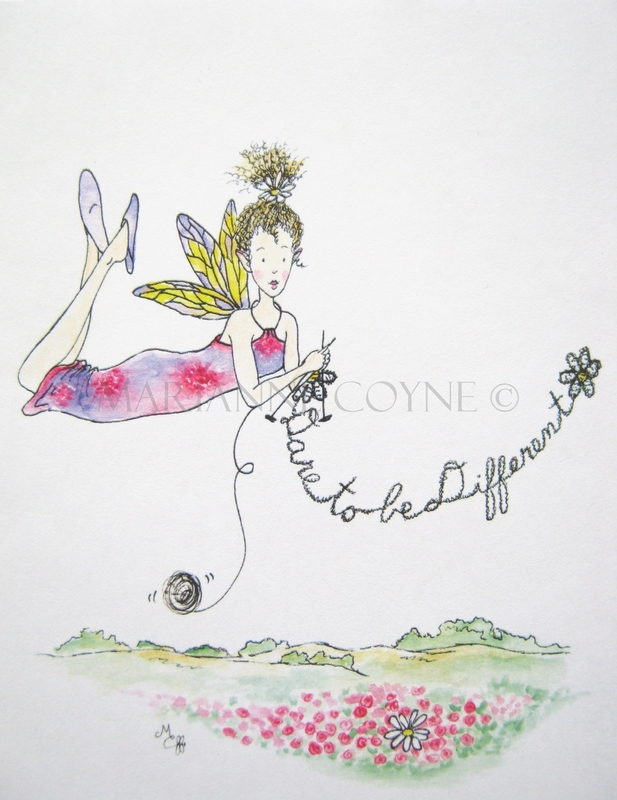 I’m delighted to see that you are getting your fairies out amoung the masses! They are beautiful, creative, and unique….the best to you! I’ll make sure all of my friends visit your site. I just saw the Christmas notecards under the November 2010 link. Would love to order some. Email me. These are unique, precious, and beautiful designs combining my favorite things with knitting. Clarina is my favorite! Oh these are the most darling faeries!! My dear friend Terri Lynn sent me here as she knows my love of faeries..I am so glad she did. I think they are very adorable!!! I’ll have to let my friends know about your blog. God Speed with your ventures.